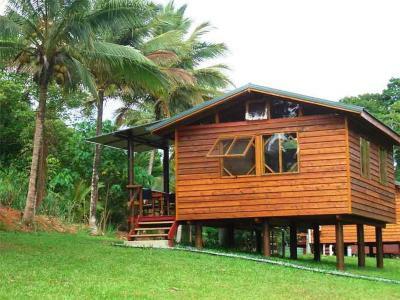 Lock in a great price for Daintree Rainforest Bungalows - rated 9.3 by recent guests. The ambience - rain forest at your doorstep, and soooo quiet. Wonderful self contained space in a lovely quiet area (except for the rainforest nightlife!) Very clean. No proper cooker but there is a camping stove for simple pan meal/kettle. Good, covered bbq area with seats and tables. Situated 1/2 way along from ferry & cape trib. Cow beach 4km away. Though no swimming anywhere on these beaches because of danger of crocs. We really enjoyed our stay. If you want authenticity can thoroughly recommend. Spotlessly clean and luxuriously appointed with a beautiful bed. Condiments and cooking supplies provided. Great hut design although a west facing sunshade might have been nice. Cow Bay beach js a hidden gem. The location was great and the welcome from Eddie was very friendly. The simplicity of the accommodation and the relaxed atmosphere. The staff were very accommodating. They gave us plenty of tips of where to do and see. The surrounding environment was beautiful and so refreshing! Excellently appointed little bungalow, complete with butane stove, pot and pan with some utensils. Spacious. Loved hearing the birds in the morning. Good location - close to the Discovery Centre. There were even a lovely bunch on flowers on the outside table. Amazing property. Owner was really helpful. Thank you for an amazing stay! 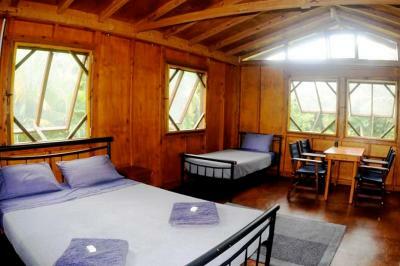 Beautiful peaceful surroundings, simple basic but comfortable cabin, easy access to Daintree. Surrounded by tropical rainforest, Daintree Rainforest Bungalows offer self-contained accommodation with free Wi-Fi and garden views. Just 5 minutes’ drive from Cow Bay Beach, the property features BBQ facilities and outdoor seating. Rainforest Bungalows Daintree is 15 minutes’ drive from the Daintree River, famous for its crocodile tours. Noah Creek is a 20-minute drive, and Port Douglas is a 1-hour drive away. The solar-powered bungalows have a kitchenette with a stove top and a small solar powered refrigerator. Each bungalow has a dining area and a private bathroom. 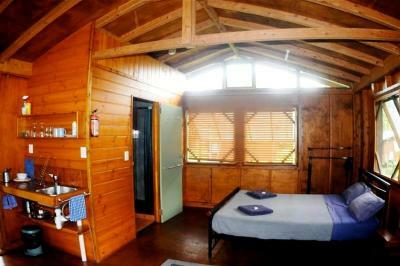 Daintree Rainforest Bungalows has been welcoming Booking.com guests since 30 Oct 2012. When would you like to stay at Daintree Rainforest Bungalows? House rules Daintree Rainforest Bungalows takes special requests - add in the next step! Daintree Rainforest Bungalows accepts these cards and reserves the right to temporarily hold an amount prior to arrival. Please note that check in times are between 14:00 and 19:00 unless prior arrangement.If you expect to arrive outside reception opening hours, please inform the property in advance, using the contact details found on the booking confirmation. It was a bit hot and sweaty in Jan - had to change the date of the booking because of the potential threat of Cyclone Owen closing the ferry crossing of the Daintree River, and one fan wasn't really enough in the bungalow. Everything was very nice. The place is really beautiful...although a little bit isolated if you do not have a car and the weather is bad (as when we staid there)...Our cabin was very nice and clean...There was no internet reception while we were there, but due to the bad weather....With nice weather and a car, it is a perfect place to stay and enjoy the beautiful rainforest and the amazing beach. Just minor things BBQ lights not operating BBQ was not easy to light uisng the automatic system Our gas canister was empty and not connected. Better signage to find the road in. Some guest noise can intrude your cottage as they are not too far apart and the area is otherwise quiet. The cabins are terrific. Very basic but we knew they would be. It was an incredible experience. Bed was comfortable but noisy. The heat of the sun which made the bungalow quite warm, but it did cool at night time.